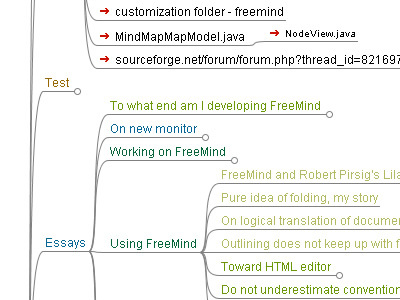 FreeMind is an open source mind mapping software written in Java and available in any major platform. FreeMind enables you to visualize ideas, projects, concepts, brainstorming, internet research or any other task that can benefit from a structured overview. You can create nodes with child and sibling nodes and add icons, clouds, notes and custom formatting for better presentation. The nodes can be expanded or collapsed, or interactively linked to local files, other maps, online resources and more. You can also insert encrypted nodes or create encrypted maps for sesitive projects. FreeMind is licensed under the GNU General Public License and it provides extensive export capabilities. The finished maps can be exported to HTML, clickable XHTML, Open Office document, image file and other formats.